9 As we said before, so say I now again, if any man preach any other gospel unto you than that ye have received (they received the gospel from Paul), let him be accursed. The context of the passage is one of amazement and disappointment. The apostle Paul is not happy with the Galatians as is clear in the whole letter, he skips his usual commendations to show how disappointed he is. It is interesting in verse 6 where we see how Paul is amazed and surprised at them. Now a good question would be why would he be amazed in that manner, what was it in the Galatians that amazed Paul to an extent that would push him to even skip any kind of commendation as he usually does in other epistles? The answer to that is really simple, he was amazed because his readers, the brethren in Galatia have already received the gospel, they have received the Spirit, they were in Christ. There would be no reason for Paul to be amazed if the Galatians have not received the Spirit. If they haven’t received the Spirit, if the brothers were not really born again, there would be no reason for him to be amazed at them. He also says that clearly in the same verse. He is amazed that they are removed FROM HIM. That means they were IN GOD. We cannot be IN GOD if we don’t have the Spirit. If we are removed from God, that means we have lost salvation, because there is no salvation except IN HIM. I think any genuine Christian would see this very clearly if they have an ear to hear. They were living the true gospel, the gospel of grace, and they moved unto another gospel. We see then that the verse is a very strong objection against this doctrine of “Once Saved Always Saved”. Let’s look at both of these objections for this verse. The objection OSAS believers use says that these believers in Galatia were never really saved to begin with. So according to that objection, these believers who heard the gospel from the apostle Paul got close to being saved but went back to the Law of Moses and therefore forfeited their chance at the true gospel of grace. Now, dear friend, please consider this, if there was no such doctrine as “Once Saved Always Saved” we would have never said these believers were not saved. There is no reason whatsoever to assume that these believers were not saved and there are many reasons to believe that, in fact, they were born again. OSAS believers are obviously looking at the passage from a window of preconceived doctrine. The whole letter to the Galatians is a letter of admonition. The brethren who Paul is angry with at the beginning of this epistle, are the same brothers he is angry with all through the letter until the end. Remember, he told them that they moved unto another gospel different from the one they received (verse 9). This is intensified by the fact that he was amazed they were removed FROM HIM (verse 6), that means they were IN HIM. It is just common sense. If I say to a soccer player “I am removing you from the team”, it doesn’t take a brain surgeon to know that the player was IN the team. But of course, this is what twisting scriptures does for the purpose of defending a preconceived idea. Galatians 3:2 – This only would I learn of you, Received ye the Spirit (we see clearly that the brothers he is admonishing have ALREADY received the Spirit by faith, they received the gospel) by the works of the law, or by the hearing of faith? Galatians 3:3 – Are ye so foolish? having begun in the Spirit (it cannot be more plain than this, Paul is obviously upset with brothers who were already IN THE SPIRIT which means “saved”), are ye now made perfect by the flesh? Galatians 5:7 – Ye did run well (they were running well, how could they “run well” if they were not already IN and “Saved”); who did hinder you that ye should not obey the truth? It is obviously clear that the brothers in Galatia were born again and on the way of salvation. Now let’s look at the second objection. Another way OSAS believers sometimes respond is to say that these brothers did not really lose their salvation. They just lost their way and Paul was trying to bring them back to the ideal way of following the Lord. Again, Paul says that they are “REMOVED FROM HIM that called” them unto the gospel of Christ. 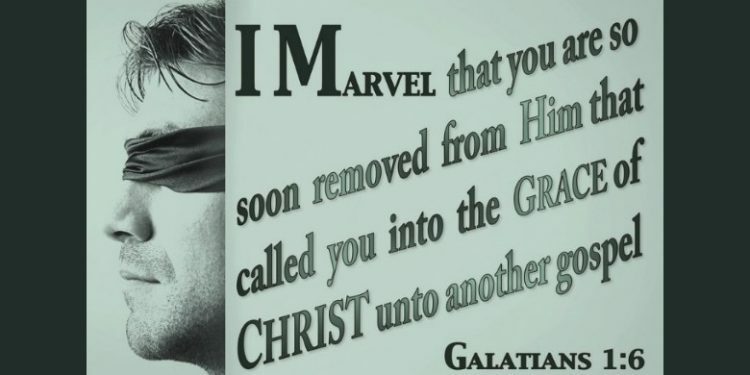 They were not removed from “the possibility of being in Him”, they were not removed from “hearing His gospel”, they were removed from HIM, GOD HIMSELF. We know that being IN GOD means saved, there is no salvation except in the Spirit, in Christ, in God. If we are removed from God, that means we are removed from savlation, we are out. Galatians 5:4 – Christ is become of no effect unto you, whosoever of you are justified by the law; ye are fallen from grace. The grace of God is obviously the means by which God saves us (Ephesians 2:8), if we fall from His grace, we fall from salvation by this grace. Unless people think they can attain salvation by works of course, then good luck with that! Dear friend, do you see how the obvious truth is just being twisted and words are being played with to make them say things they don’t say? I really am amazed at how clear twisting scriptures can be without people realizing it. Don’t let prejudice of taught doctrine blind you. Get free from taught doctrine and read OUT of the scriptures instead of reading INTO them. Accept the whole truth as it comes without looking at scriptures from a window of preconceived doctrine. Your soul is on the line dear friend! Don’t trust other people, trust the Lord, seek Him and He will show you the Truth as it is clearly laid out in the Bible. May God open the eyes of our brothers from the OSAS camp!